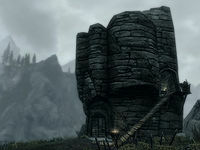 Cradle Stone Tower is a remote tower due west of Bard's Leap Summit, which is occupied by a hagraven. After scaling the Forsworn-filled hills at the Lost Valley Redoubt and crossing the waterfall at Bard's Leap Summit, follow the trail up the west hill, looting a chest along your way to this remote tower. An alternate and more adventurous route to the tower is by climbing the rocky formation from the unmarked crevice where Frofnir Trollsbane is located (map). By doing so, you can bypass the Forsworn-infested redoubt entirely. The tower has a total of four floors to it. The lowest level is accessed via a novice-locked gate. Inside at the top of the stairs is a broken stone table with a random dagger and helmet (see notes) on top and a burial urn beside it. The stairs lead down to a caved-in section with an apprentice-locked chest. There is no access from this level to the second floor. Outside of the tower is a wooden ramp that leads up to the second floor where you will encounter the only occupant of the tower, a hagraven. The second floor also contains a sideboard opposite the doorway, holding a copy of the Alteration skill book Sithis with a set of shelves to the left holding a random magicka potion and a flight of wooden stairs leading up to the third floor. At the top of the stairs there is a pressure plate that triggers a spellcaster trap that fires lightning bolt that is situated across the broken floorboards to the north. There is an urn to the left and a broken sideboard holding a medium coin purse to the right of the trap. Against the west wall is another flight of wooden stairs leading to the top floor, to the left of this is a random greatsword sticking out of the rubble. The top floor is the smallest floor and only has a bird's nest containing a pine thrush egg on it. It does offer a nice view as well. A corundum ore vein is located right outside the entrance to the tower. An iron ore vein is located a short distance southwest. The random dagger and helmet don't appear to respawn. If you have already cleared Lost Valley Redoubt and fast travel to Cradle Stone Tower, the fast travel may instead place you at the word wall section of Lost Valley Redoubt. This bug will correct itself after you have cleared Cradle Stone Tower. ? This page was last modified on 28 July 2017, at 05:23.